The Skeptical Spouse and I keep an informal running list of terms we hope never appear in a news article that includes our name. These terms include "beyond recognition", "fireball" and "torso." I'm sure you could make your own list. After having just posted The Three-Gun-Monte Sack O' Fertilizer Conviction and Execution of Frances Elaine Newton, I'm ready to add "backspatter" to my list of words to avoid. I'll allow Vincent DiMaio to define backspatter for us. He is the former medical examiner for Bexar County (i.e. San Antonio) and author of the ever popular Gunshot Wounds: Practical Aspects of Firearms, Ballistics, and Forensic Techniques. Backspatter is the ejection of blood and tissue from a gunshot wound of entrance. While blood and tissue are often ejected from exit wounds, this is not the case for entrance wounds. The occurrence and degree of backspatter depends on the anatomical location of the wound, the range and the caliber of the weapon. A contact wound of the head from a large-caliber weapon is more likely to produce backspatter than a distant wound of the torso from a small-caliber weapon. Backspatter is important because the resultant stains may be found on the weapon, the shooter and objects in the vicinity. 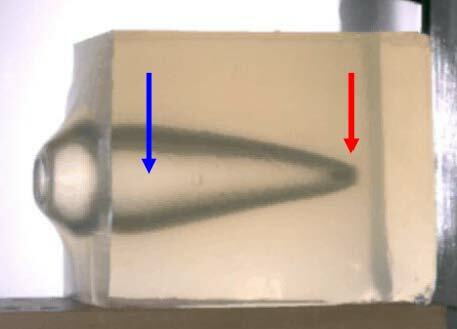 The red arrow indicates the location of a 9 mm bullet as it travels at high speed through a block of ballistics gel. The blue arrow points at the temporary cavity left in the bullet's wake. In a small fraction of a second, the bullet cavity will collapse back to the diameter of the bullet. When something similar happens to a person's head, Adrian Newton's head for example, the collapsing cavity and the expanding gunpowder gases will force blood and brain matter out the entry wound. If you happen to be the one holding the pistol against Adrian's head, you're going to end up with blood and brains all over your person, clothes, and gun. If the bullet exits the head, most of the spatter will be from the exit wound. That's called frontspatter. If, however, the bullet remains in the head, as it did in Adrian Newton's head, then the material has no place to go but out the entry wound. The Houston police found no backspatter on Francis Elaine Newton, or her clothes, or the weapon they claim she used to kill her husband (and her two children). The absence of backspatter on her clothing is particularly noteworthy. The State's case depended in large measure on a trace of nitrate found on the hem of her skirt. According to the police theory of the case, the nitrates would not have been there had the skirt been washed or had it been a different one than she wore the night of the shooting. I will post a similar discussion of gunshot residue soon. For now, you can ponder whether you, as a skeptical juror, would have sent Frances Elaine Newton to the gurney knowing then what you know now about backspatter.